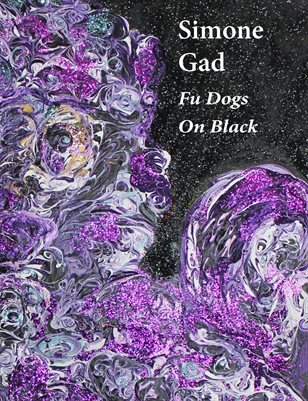 The latest body of work by artist Simone Gad, Fu Dogs on Black. Fu Dogs are Chinese guardian lions often seen at the entrance to buildings. Simone’s Fu Dogs have become more and more abstract reaching an apex for this current series appearing a expressive swirling paint. After being introduced to the Fluxus movement in 1972 by Al Hansen, Gad began making collage and assemblage painting collages on vinyl. Her career includes numerous exhibits throughout California and beyond. Gad is highly regarded in the Southern California art scene, she was part of the Getty’s PST LA/LA, celebrating historically significant Southern California artists. She is included in MoMA/PS1 Archives, Smithsonian Library Archives, LAICA Journals, and is the recipient of numerous awards and grants, publications and texts.